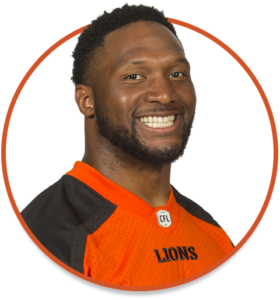 Following a standout career at the University of Idaho, Rolly was the Lions’ second-round selection (9th overall) in the 2008 CFL Draft. He inked a two-year contract in January keeping him in orange and black through 2018. 2018: The 11-year vet appeared in 17 games with the Lions, proving to still be one of the game’s elite fullbacks. Rolly carried the rock twice for three yards and caught two passes for seven yards during the regular season. Rolly also played extensively on special teams, recording six tackles. He started at fullback for the Lions in the East Semi-Final against the Hamilton Tiger-Cats. His contributions rarely show up in the stat sheet, but Rolly’s teammates know the true value he brings as a blocker and leader. 2017: Rolly’s tenth season with the BC Lions was memorable on a couple of fronts: with the departures of Ryan Phillips and Jason Arakgi, he became the club’s longest tenured player. The ageless fullback also suited up for all 18 regular season games for the seventh straight season, extending his consecutive games streak to 135. Along with providing a leadership role on special teams and a force in the blocking game, Lumbala recorded 11 catches for 93 yards. 2016: Dressing for all 18 regular season games for the sixth time in as many years, Rolly enjoyed another steady and productive campaign for the Leos. As effective as ever in his role as a blocking back, Rolly still managed four carries for a career-high 46 yards as well as a career-best 31-yard romp versus Saskatchewan on November 5. He also chipped in with another 70 yards through the air on eight receptions and continued his valuable role on special teams. 2015: Rolly dressed for all 18 regular season games for the fifth consecutive season seeing action as the team’s primary blocking back and special teams ace. Rolly hauled in two passes last season and notched his second career touchdown through the air, the last coming as a rookie in 2008. He also tallied nine special teams stops on the season. 2014: Appearing in all 18 regular season games for the sixth time in his career, Rolly continued his steady play as a blocking back and special teams ace. While his carries out of the backfield were limited to five touches for six yards, Rolly did record a career-high 14 receptions for 125 yards. He also pushed his career special teams tackles total to 83 with eight on the season. 2013: Rolly played all 18 regular season games last season for the fifth time in his CFL career and stretched his consecutive games-played streak to 63. Seeing more time on special teams, he led the club for the first time in his career with 19 tackles, 14 more than he had in 2012. 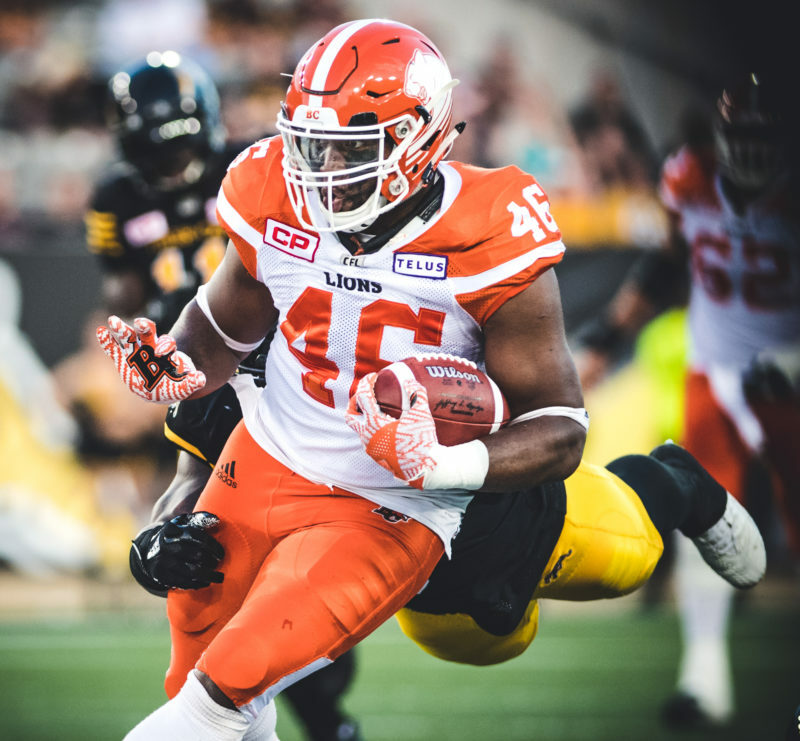 On offence, Rolly continued his key blocking role for Andrew Harris and Stefan Logan and had four carries himself for 31 yards including a career-high 29-yard dash recorded against Edmonton on July 13. 2012: Rolly played all 18 games last season for the fourth time in his CFL career. A key element in the Lions’ running game as lead blocker, he also carried the ball six times for 32 yards and a TD (Sept. 15/12 vs Tor). In limited offensive time, Rolly registered career-highs of seven receptions for 66 yards including a 21-yard catch vs Saskatchewan in the regular season finale. On special teams, Rolly chipped in with five tackles. 2011: Rolly played all 18 games last season seeing time as the Lions’ primary blocking back and as one of the leading special teams stars. In the latter role, he was fifth on the club with 12 special team tackles. On offence, he carried the ball three times for six yards and one TD, and grabbed three passes for another 28 yards. Rolly also played in the Western Final and Grey Cup game. 2008-2016: A veteran presence for the club both on and off the field, Rolly has become one of the longest-serving players on the active roster after being drafted by the Lions in 2008. A talented blocking back and special teams leader, he has now logged 153 regular season games which places him in the club’s top-50 all-time. Rolly hasn’t missed a game in six seasons and prior to that, his absence from the Lions roster was due to an NFL tryout with the Miami Dolphins. Notching a career-high 14 receptions for 125 yards in 2014 and a career-best 46 rushing yards in 2016, Rolly continues to evolve as an offensive weapon while adding to his tackle total on special teams which now stands at 93. Lumbala enjoyed a productive career at Idaho, appearing in every regular season game for the Vandals since his freshman season in 2004. Used primarily as a blocking back, the Calgary-native had eight catches for 67 yards in his senior year. Rolly was a Sport Science major at Idaho and has four siblings (two sisters and two brothers). In addition to football, Rolly also played basketball in high school and still enjoys playing the sport during his spare time. A football player since the age of 12, Rolly notes 2011’s Grey Cup win as his fondest memory but hasn’t forgotten about his pro debut in Calgary in front of family and friends in 2008. In 2011, Rolly took part in the CFLPA’s Huddle for Haiti project and spends most days working at Husky House, a local foster home for at-risk youth. When not actively participating in the club’s off-season community programs, you’ll most likely find Rolly at the movie theatre.